Recently, I was asked to contribute on an article about healthy office lunches, and I jumped at the opportunity because this is something I get asked almost every week. I thought I would also put together a more comprehensive post with great office lunches including some that require a small amount of prep (the night before or on the weekend), and some that just require you to go to the supermarket and pick up the ingredients. Any leftovers from dinner are great to take for lunch the next day! Slow Cooker Mexican Chicken Bowls - need to prepare ingredients and add them to the slow cooker the night before, that's it! Quinoa Salad - served with tuna or marinated tofu - need to make the quinoa salad ahead of time. Soba Noodle Salad - served with tinned salmon or tuna - need to make the soba noodle salad ahead of time. Salad with tuna and sweet potato - you just have to pre-cook the sweet potato ahead of time. Roast mixed veggies on a roll. Bake the veggies on the weekend and bring them to work with some cheese and a roll. 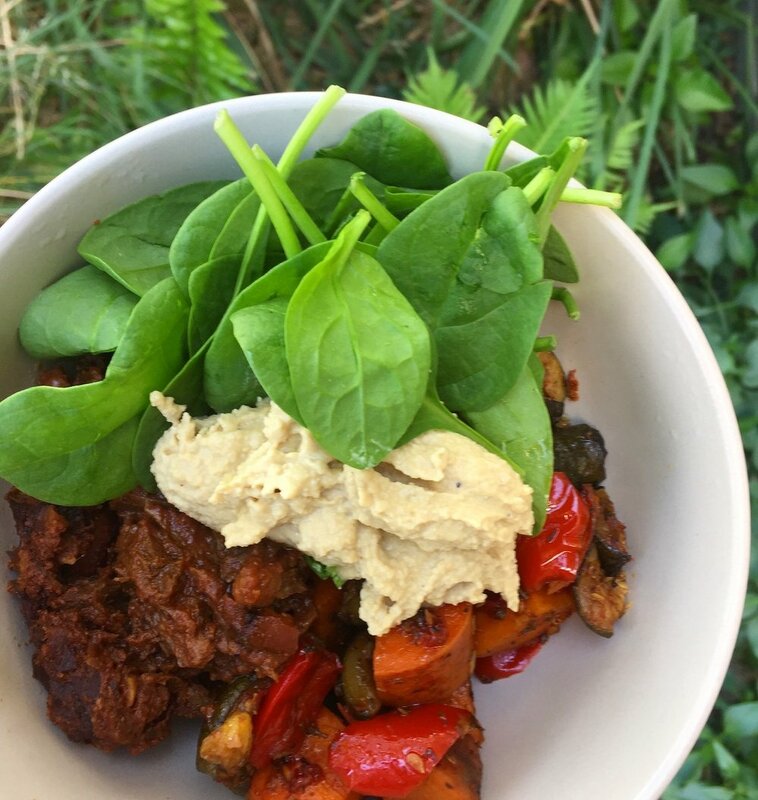 Roast mixed veggies, slow cooked beef and jalapeño hummus served with baby spinach. Just prep the ingredients ahead of time. 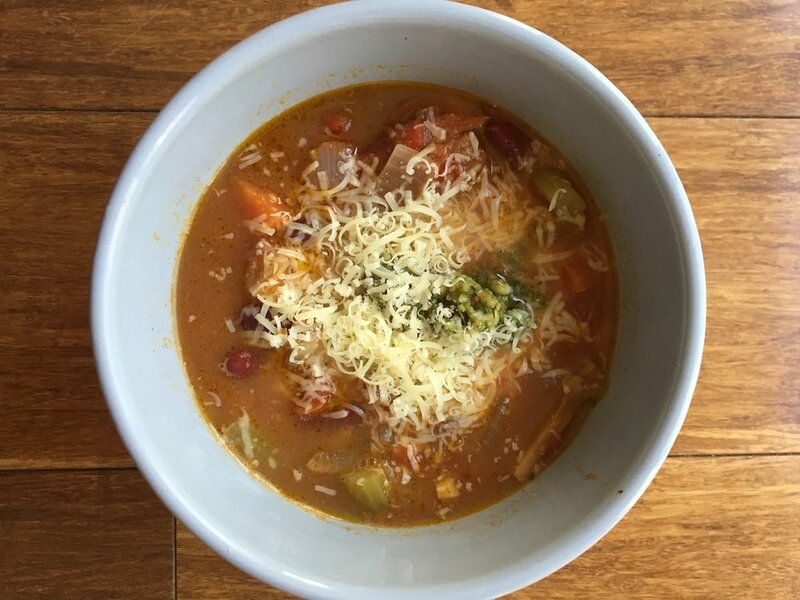 Hearty Minestrone Soup - served with some toast for a satisfying and warming lunch. Tuna and salad mix wrap - wraps, a tin of tuna and some salad mix. Avocado, hummus or feta would all work well for a spread on the wrap. A sandwich with veggies and lean meat. This one has ham, cheese, tomato and lettuce. Roast chicken with salad. Roast chicken, salad mix (or kale slaw), 1/2 tin of chickpeas, avocado and some dressing (I use balsamic and olive oil). So easy and so satisfying. Soup (you can buy fresh soup from many supermarkets, or there are now heaps of different brands offering soups in pouches, which just need to be microwaved) with a grainy bread roll. Are there any easy lunch ideas that I've missed? I'd love to hear your easy lunch ideas in the comments section below. If you found this article useful, share it around to your friends and family members.